Picture pieces of rusted iron, makeshift fly swatters and pairs of turquoise and purple gloves. 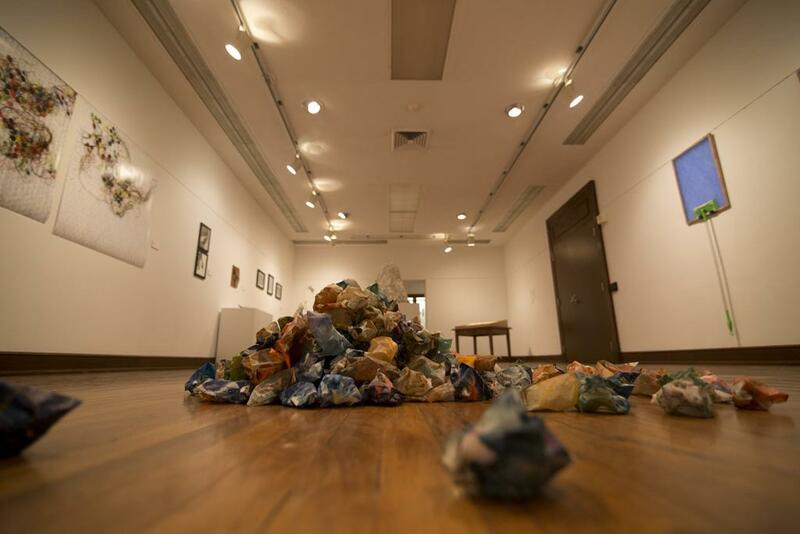 It might seem difficult to draw a connection between these individual items, but the new exhibit on display at the Frick Fine Arts Building’s University Art Gallery contains all of them, each speaking to the experiences of art students who participated in the 2015 Summer Studio Arts Field Study in Wyoming. The studio arts department organizes a Wyoming field study every summer at the Allen L. Cook Spring Creek Preserve, which Wyoming rancher Allen L. Cook donated to Pitt in 2005. The four students who attended the 17-day field study, Megan Beck, Alyssa DiFolco, Sofia Sandoval and Victoria Woshner, all senior studio arts majors, submitted pieces in a variety of mediums to the Studio Arts Summer 2015 Creative Research Exhibition, which opened last Friday and runs until Feb. 5. As a distinct departure from the Pittsburgh setting that most student galleries draw inspiration from, the Wyoming geography and fauna pervades nearly all of the pieces in the exhibit. This energy translated in different ways for the artists. DiFolco, a senior studio art and history of art and architecture major, created a series of oversized fly swatters, titled “They’ll Get You Where It Itches the Most.” As the title suggests, DiFolco pays homage to combating Wyoming’s pesky mosquitos by assembling random objects to build the flyswatters, including a broom attached to dustpan, a piece of cardboard and a warped metal sheet. The fly swatters don’t just speak to her summer experience, though, but to a newfound way to be creative — many of DiFolco’s pieces in the exhibit use and draw their inspiration from everyday objects. Despite the Wyoming theme, not all the pieces are removed from the Steel City’s industrial influence. Sandoval, a pre-med and studio arts double major, submitted a piece featuring several bits of iron that she strategically placed in a series of different environments. Sandoval left some in a nature reserve, others on a road outside the Wyoming reserve and some were even left lying on a railroad track. She left them in each location for a two-week period in order to demonstrate the different levels of rusting and bending that occurred in each spot. Stephanie Taylor was the only artist in the exhibit who did not travel to Wyoming, instead completing work in Pittsburgh over the summer using a Summer Undergraduate Research Award she won from the Kenneth P. Dietrich School of Arts and Sciences. She created a collection of abstract prints that deals with complex themes like death, decay and rebirth. Of the work she submitted, Taylor said her favorite piece is “Compost/Retribution,” a print portraying a decomposing butterfly. Taylor created the print to address the idea of finding a new purpose for a “ruined” thing. “The title offers greater implications of the act of decomposing as something that presents the potential for new life,” Taylor said. Even though she created her prints at Pitt, she still said she would want to visit Wyoming some day in the future. Visitors may be struck by a desolate sadness in the wilderness of Wyoming. Woshner’s “Experiment #2a” consists of a looping video of a campfire followed by two photographs. The first portrays the campfire at night, a bright orange tone contrasting against a sea of black, while the second is the ashy remnants of the campfire set against a sweeping desert landscape. Another piece by Megan Beck, “Blue,” is a series of three photographs capturing a blue jay lying still on top of three different elements — one on a piece of wood, one on a patch of sand and one lying on a handful of rocks. “The pictures of the bird made me think of death,” said Richardo Brown, a sophomore studying sociology and political science. “Its bright blue wings stand out against the bleak dryness of the earth. It’s telling us that all things die.” In her artist statement, Beck said that her interest in anatomy drives her body of work. Apart from offering visitors a taste of the warm western prairie in the dead of winter, the exhibit’s emphasis on nature and simplicity is captivating enough.